Traveling should be a fun and relaxing experience for everyone. However, for long-distance travel, people tend to sleep while they are traveling. For that, they need a proper support for their neck while sit-sleeping, otherwise they will encounter tiredness and uncomfortable traveling experience caused by neck pain. 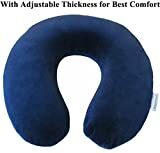 As such, travel pillow is essential for those who like to travel or need neck supports wherever they go. The below list will show the top 10 best travel pillows that every traveler loves. Coming in at number 10, the Travelmate Travelmate Memory Foam Neck Pillow is great for traveling thanks to its size and good materials. The pillow sizes at 11 x 12 x 3.8 inches, perfect for neck sizes in general. It is made from top quality, thermos-sensitive foam that helps to maintain the head and neck alignment very well. The pillow has a zippered cover that is washable with either hands or machine. Objectively made for a better night-sleeping experience, Shredded Memory Foam Pillow is usable for both your daily bed and traveling. You may want to grab this pillow with you while you are traveling to make sure you are sleeping elsewhere just like at home. 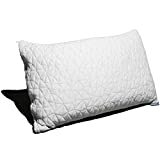 Manufactured in the United States, this pillow is made of authentic CertiPur-US certified foam that provides great comfort for all sleep positions. The pillow is also great for allergy sufferers who find it difficult to get a proper pillow, thanks to the Hypoallergenic and Dust Mite Resistant technology used by the Shredded Memory Foam Pillow. Travel-rest is one the uniquely designed and well made products out there in the market, which provides both comfort and convenience while traveling. 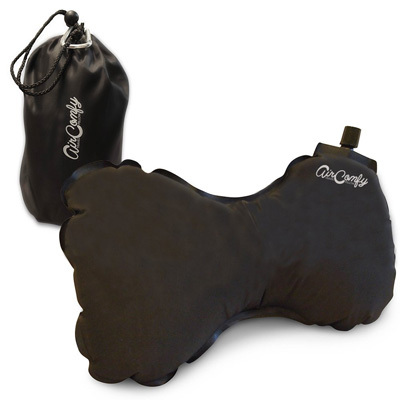 With its full lateral support for the upper body, this pillow is perfect for those suffering from chronic neck pains. You can position the pillow alongside your body while sit-sleeping, just like a seat belt, and you are good to go. 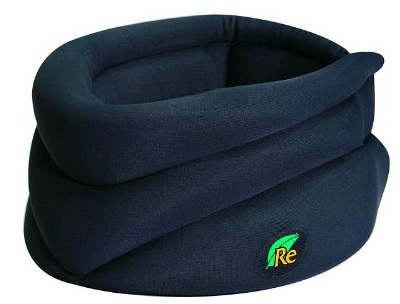 The pillow will protect your head and neck alignment to give you a relaxed and deep sleeping experience while traveling. 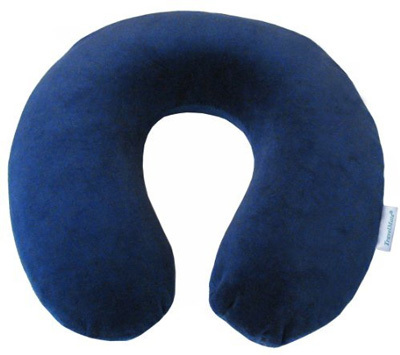 According to its customer reviews, AirComfy Travel Pillow for Car, Airplane or Lumber Support is one of the top-rated travel pillows out there in the market. The pillow is made for self-inflated, and thus you can inflate the pillow in seconds by yourself. 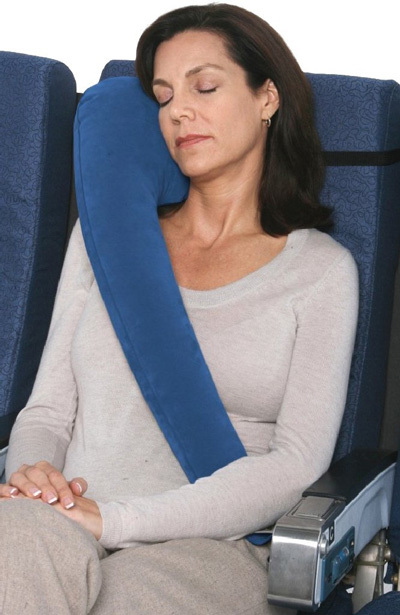 Unlike the bulky, U-Shaped pillow, the AirComfy Travel Pillow is a standard looking pillow with unique side wings that rest underneath your head and neck to ensure proper alignment that gives comfort and eliminates neck pains. 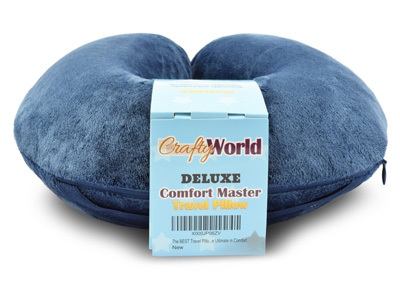 The Comfort Master traveling pillow is well known for its design, quality and versatility. The pillow is made of thermos-sensitive memory foam with microfiber-like cover. The cover comes with a removable zipper that lets it washable. Not only you can use the Comfort Master for travelling in buses, trains or planes, but you can also use it on your working or gaming chair to get the comfort you need to be more productive. 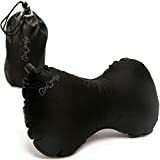 This pillow is probably quite large for traveling; yet, considering the quality of the product, it is worth considering taking with for your next trip. 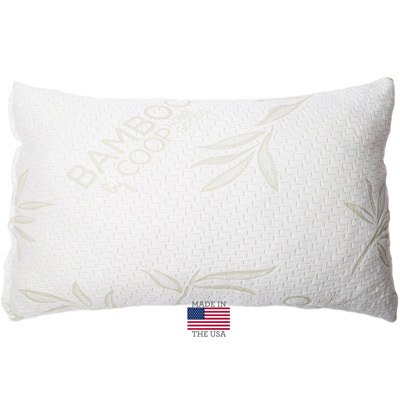 If you are not concerned about the size of a pillow, then this Snuggle-Pedic King Size Bamboo Combination Shredded Style Memory Foam Pillow is definitely the right choice for you. 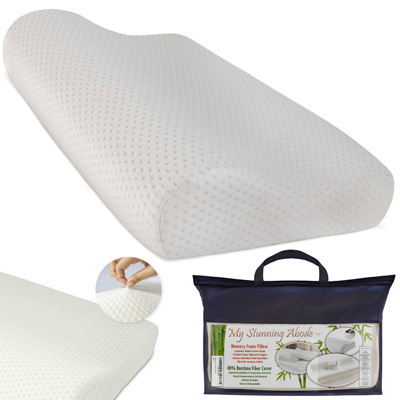 Its soft and micro-vented breathable cover makes it a very comfortable pillow for everyone. Dust-allergy sufferers can also make use of the product, thanks to its hypoallergenic and dust mite resistance technology. 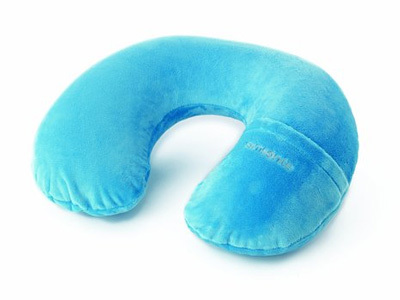 The Relaxing Microwavable Neck Pillow is one of the greatest pillows not only for its travel-friendly features, but also for its stress-relieving blend of herbal scent that is great for relaxing. If the weather is too cold, you may want a nice, warm sleep with the pillow by putting it in your microwave for just a few minutes. With such unique features, this pillow is well designed to calm and comfort you both physically and mentally. The Ergonomic Memory Foam Pillow hits the top 3 caliber due to the great design and quality sleeping experience the pillow provides. Unlike normal pillows, the Ergonomic Memory Foam Pillow provides you with comfortable and undisturbed sleeping that contribute to a restful and relaxed sleep. The pillow is very well made of allergy-free materials that are friendly for both normal and allergy-prone people. The size is standard and suitable for everyone. With a contoured design and bamboo cover, this pillow provides nothing but the correct alignment and feeling that your body deserves. Standing at number two, the Caldera Releaf Neck Rest is a compact, polyurethane foam pillow that provides users with comfortless anywhere they go. Suggested for but not limited to traveling purpose, this pillow is also great for working, gaming or reading as well. 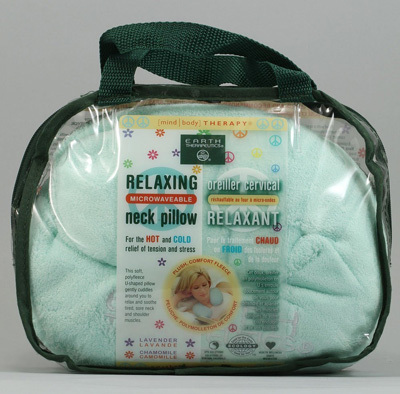 The Caldera Releaf Neck Rest is very lightweight and perfect for reducing neck and shoulders tension, especially older people who are prone to neck pains. This pillow will cover all around your neck to provide the best alignment that ensures no pain and comfortable sitting throughout the day. Samsonite Luggage Inflatable Neck Pillow is easily the best travel pillows out there in the market right now. The price comes in very cheap, considering the quality of the materials used and the comfort it provides. Any traveler would love a Samsonite Luggage Inflatable Neck Pillow along their side while traveling simply because of its soft microfiber-like feeling that gives maximum comfort for sit-sleeping. More importantly, this pillow comes with a distinct feature that everyone loves, i.e. 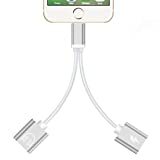 built-in pocket, perfect for storing an iPod or eye-mask. This pillow is simply the best and a must-have item for your traveling. Having a comfortable and restful sleep while traveling is essential for a better experience of your trip or holidays. It is very important that you always have your favorite and quality travel pillow with you along the way. Find the one that suits your types and enjoy your traveling!